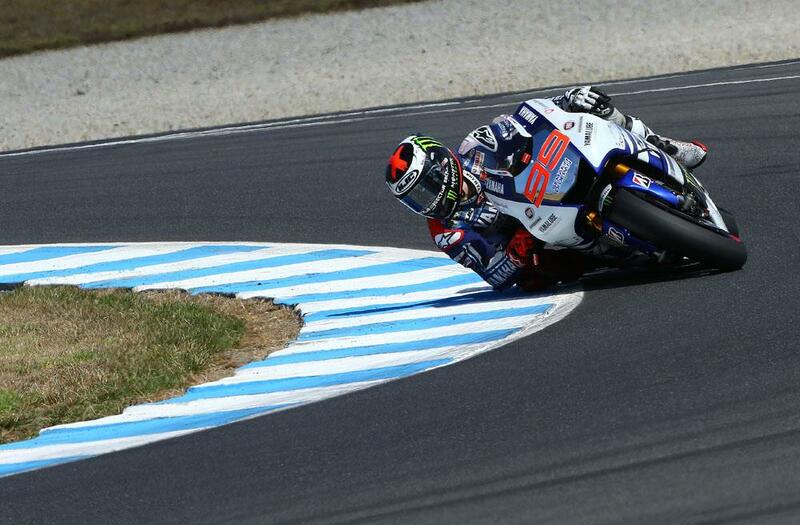 Spaniard Jorge Lorenzo put his tyre woes in Sepang last week to one side to head the timesheets on the first day of an official Bridgestone test at Phillip Island today. Lorenzo was highly critical of Bridgestone’s new generation 2014 tyres when he slumped to a lowly seventh place in Malaysia last week. He found Bridgestone’s rubber more to his liking in Australia today when a best lap of 1.29.213 saw him finish quickest of the five-strong MotoGP field on track at Phillip Island today. Bridgestone arranged this week’s three-day test in response to last October’s tyre fiasco during the Australian Grand Prix. A new surface led to severe tyre wear and forced race management into the unprecedented move of enforcing a mandatory pit stop in the MotoGP race. Yamaha, HRC and Ducati agreed to send Lorenzo, Valentino Rossi, Dani Pedrosa, Marc Marquez, Cal Crutchlow and Andrea Dovizioso to assess a range of new spec tyres designed to alleviate the excessive wear issues experienced almost six months. A broken right leg he suffered in a training accident recently though has prevented Marquez from attending the Phillip Island test. Bridgestone confirmed this morning it had six new rear specs to assess during the three-day test, but everybody started this morning doing a maximum of six lap runs on rubber identical to the spec that performed so badly and inconsistently during the race weekend. Lorenzo’s best lap of 1.29.652 just edged out Ducati rider Cal Crutchlow by 0.363s, with Rossi taking third place with a best lap of 1.29.730. Each rider today had to test three new spec tyres and complete one timed run of six laps, pit in, and then complete another six laps. Riders were split into groups, so Crutchlow and Rossi tested the same spec tyres, while Lorenzo and Dovizioso evaluated another batch and they will switch in what is expected to be improved conditions tomorrow. Bridgestone wasn’t alone in experiencing severe tyre issues last October and Dunlop had Tito Rabat, Mika Kallio, Nico Terol and Jordi Torres assessing a wide range of new Moto2 tyres today. There was a total of 11 new tyres to test, with each rider asked to test a combination of nine. Dunlop has also requested that each rider completes two race simulations on different spec tyres. Rabat was the quickest of the quartet with a lap of 1.32.316 coming in a marathon 100-lap stint. Marc VDS Racing Mika Kallio survived a scare this afternoon when he suffered a big high-side at the Siberia corner. His Kalex machine was badly damaged but x-rays at a local hospital fortunately showed only bruising but no broken bones in his left wrist.